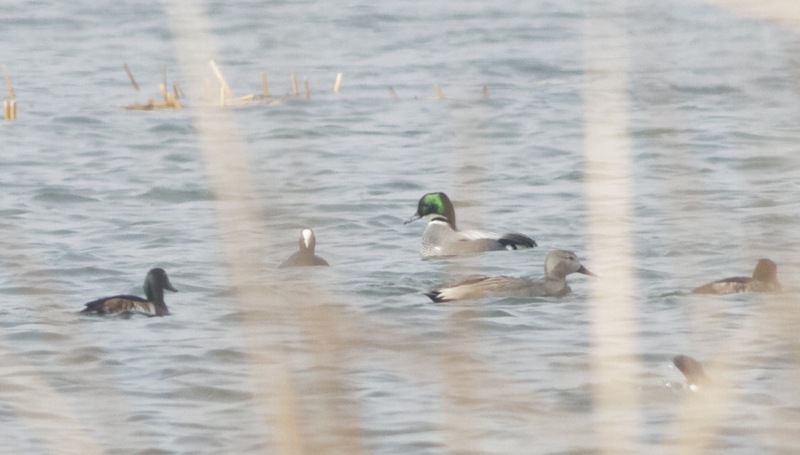 An adult drake BAER’S POCHARD at Ma Chang. A welcome sighting of this now Critically Endangered species. On Sunday I visited Ma Chang, Wild Duck Lake. April and May are superb months to visit this special Beijing site. With migration in full swing, it’s fascinating to see the departure of the winter visitors, the arrival of summer visitors and the passage of migrants on their way to breeding grounds further north… Already many of the winter birds have departed – I didn’t see a single crane of any species on Sunday – but many others are just beginning to arrive. 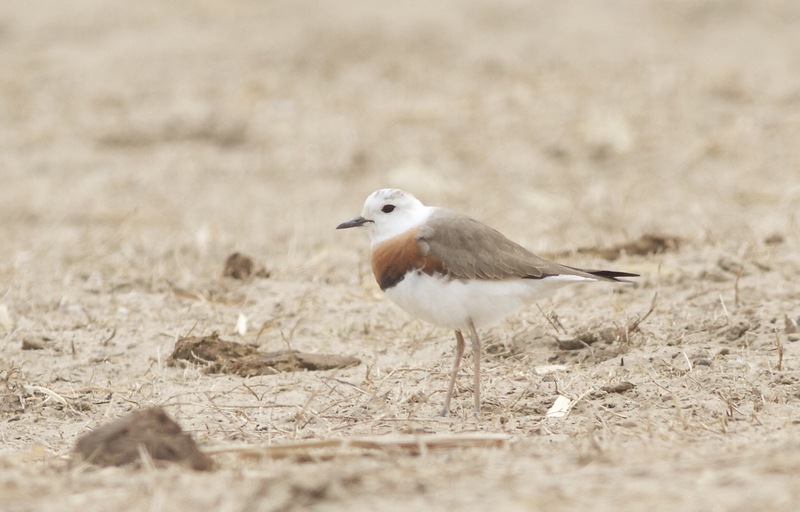 Oriental Plovers – a Ma Chang speciality – are coming through in good numbers now and it’s a great time, too, for wildfowl and some of the early raptors. The excitement of my visit on Sunday was heightened by the news that a BAER’S POCHARD was found on Friday by local birders Zhu Lei and Zhang Shen (thanks guys!). This bird is classified as “Critically Endangered” and, I understand, a survey of its traditional wintering grounds in China produced fewer than 50 birds this winter. Look out for a forthcoming article in Birding Asia about the dramatic decline of this species. 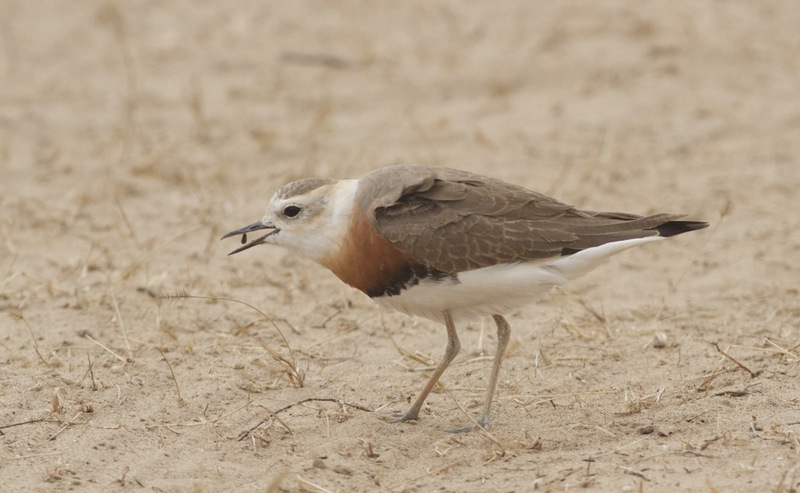 On arrival I was delighted to see some ORIENTAL PLOVERS on site. I counted 14 and, after watching them briefly, I made my way to the first site for checking duck. Viewing wildfowl is not straightforward at Ma Chang; there are many areas that are not viewable and the precise location of the birds depends on many factors, such as the wind direction and speed and the activity on the lake of the local fishermen. I have two favourite locations – one at the spit by some yurts (also a good place for visible migration) and one on the ‘island’ to the north. On Sunday, both sites were notably empty of duck. I was beginning to think that it wasn’t going to be my day and that the duck must be hiding somewhere out of sight. Then I saw a small flock of Tufted Duck (not a common bird in Beijing) fly in and go down behind some reeds. I could see that there was a track that ran close by, so I made my way to the general area and found a good place to view the duck. Unusually, there was no northwesterly wind blowing into my face, so the conditions were good. I soon realised that it wasn’t just the Tufted Duck present. There were some Ferruginous Duck (a species with which BAER’S POCHARD often associates), Shoveler, Common Pochard, Smew, Falcated Duck, Gadwall, Wigeon and Mallard all present. A careful scan revealed no sign of the Baer’s but I knew there were some duck asleep in the reeds, including some Ferruginous Duck and some others that were obscured.. I settled in, hoping that one of the sleeping duck out of sight might be the Baer’s. After 45 minutes of enjoyable birding, including a nice flock of passing Swan Geese, a small passage of Buff-bellied Pipits and an early male Citrine Wagtail, I began another scan and, sure enough, in amongst the Ferruginous Duck was a stunning drake BAER’S POCHARD. I watched the BAER’S for the next hour as it proceeded to display. Unfortunately there were no female BAER’S but that didn’t seem to matter.. this lonely male threw its head back, stretched its neck high and bowed to several female Ferruginous Ducks and a slightly startled-looking female Common Pochard… I guess when your situation is as desperate as the Baer’s Pochard, you can’t afford to be fussy! It was heartening to see this bird but, at the same time, sobering to think that it is likely to make its way north alone and, when it arrives at its favoured lake, there may be no females with which to breed. The situation for this bird is precarious. Encouragingly I have heard of two separate sightings from Liaoning Province in the last few days – one male and one female. Let’s hope it’s a good breeding season for this species. After an hour or so, I reluctantly pulled myself away to explore the rest of Ma Chang. 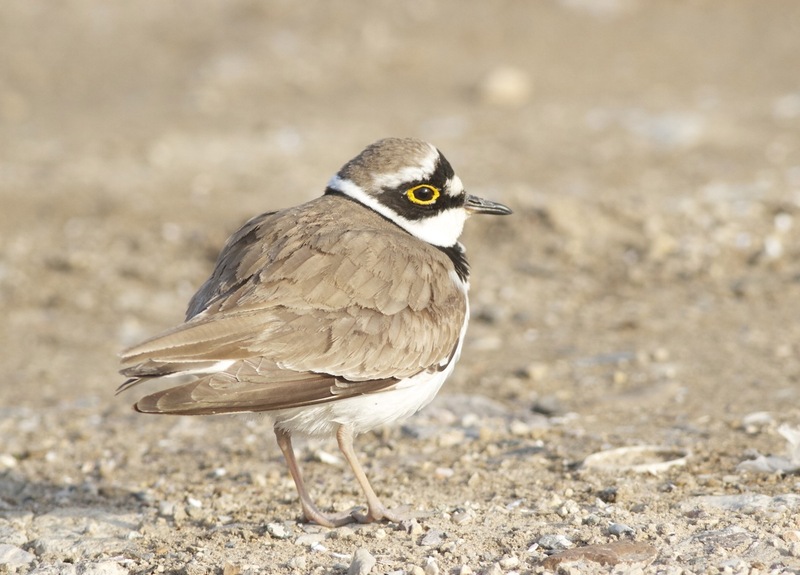 The Oriental Plover flock had increased to an astonishing 55 birds, with 4-5 adult males sporting gleaming white heads. 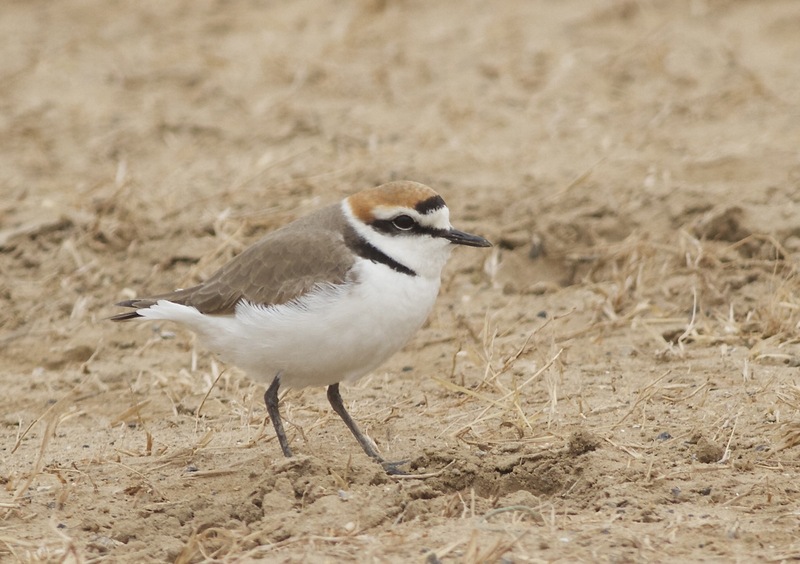 Oriental Plover (male), Ma Chang. Flocks of Little Ringed and Kentish Plovers were mixed in, many of which were displaying and calling frequently. At one point, as I was watching the flock, all of the birds suddenly took flight. 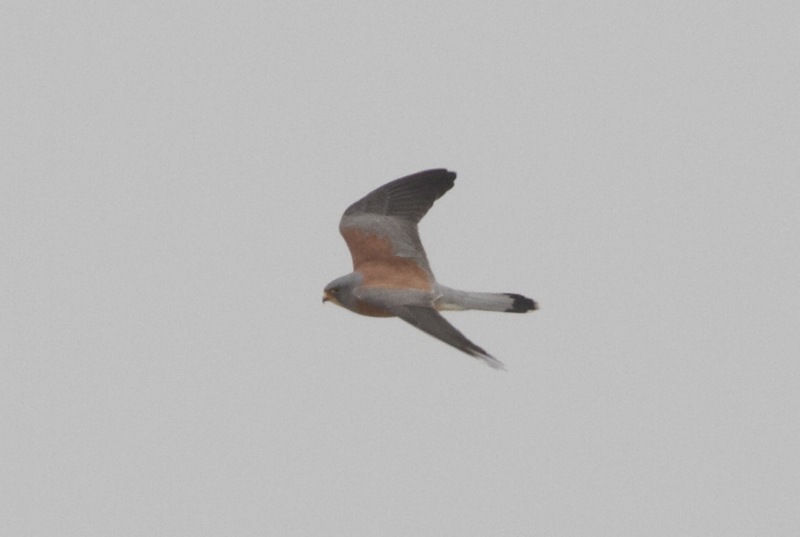 I suspected a raptor and, sure enough, a quick scan with the binoculars revealed a superb male LESSER KESTREL.. wow! A nice way to end a brilliant birding session at Ma Chang. Lesser Kestrel (male), Ma Chang. BAER’S POCHARD – 1 drake displaying to both female Ferruginous Duck and Common Pochard. Employed three ‘displays’ – one involved stretching the neck high, the second throwing the head back and the third leaning the head forward and ‘puffing up’ the back of the neck. Oriental Plover – 55 – the number seemed to increase as the day wore on with just 14 present early morning. Some disturbance from bird photographers and horses but they were not unduly perturbed.